Pressure reducing & surge control valve automatically reduces a higher inlet pressure to a steady lower downstream pressure regardless of flow rate and inlet pressure fluctuations. 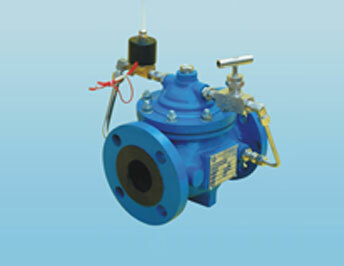 Pilot valve enables the main valve to close quickly to prevent downstream surges. Temperature Range : -40 to 90 deg.C. The Series 300 & 400 consists of the particular range of pressure reducing valve. The valve's name itself narrates function. The valve automatically reduces a higher inlet pressure to a steady outlet pressure to a steady lower downstream pressure regardless of changing flow parameter and fluctuations in upstream. A solenoid valve is provided to intercept the operation of the pressure reducing control. 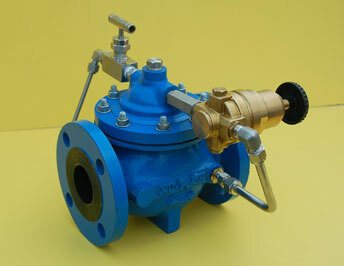 The series 500 valves consists of a wide range of float valves. 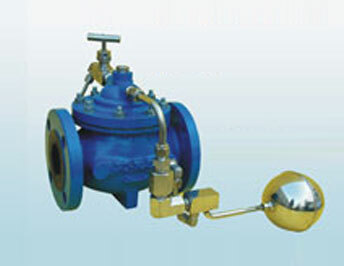 Valves are available for horizontal mounting and vertical mounting. They are designed to controls the level of liquids in open tanks, ponds, basins, and other similar reservoirs. The series consists of 501-modulationg float valve, 502-float on-off globe type valve, 503- float angle type valve. Angle : 50-100 mm screwed, 100-150 mm flanged. The 600 series solenoid control valve is classified in two categories (1) Globe and (2) Angle type. 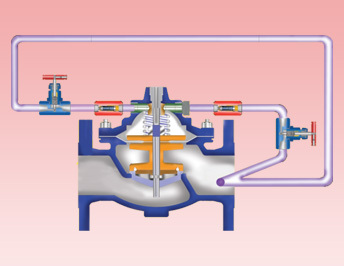 The valve is a self-contained unit consists of a diaphragm operated main valve with two solenoid pilot valves. The first (globe) will permit main valve to open when de-energized. The solenoid pilot valve may be activated by pressure, temperature, clock, and float. Etc. other features are available on custom basis. The 700 series Non-slam check valves are diaphragm actuated. The higher downstream pressure enters the valve cover thru a control tube and the valve closes. Valve closes when air/hyd./electrical pressure, signal is applied to the cover of control. Valve opens when air/hyd./electrical pressure is relieved from the cover of control. Manual by-pass allows manual opening of the valve. 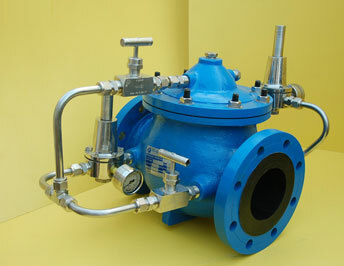 The Nu-Tech ACV 800 deluge valve meets all requirements for Indian listed, fire protection service. Valve opens on demand to provide water flow to the fire protection sprinkler system. Pilot system can be hydraulically, pneumatically/electrical signal or manually operated. Opening of valve is by loss of control pressure or by manual opening. Temperature Ranges : -40 to 90 deg. C.
The 900 series altitude valves controls the liquids automatically in terms of their level in the reservoirs without any additional arrangements like float or other controlling devices. Function: It automatically controls the liquid levels in the reservoir. The design is compact and easily mounted on the equipment and has free maintenance characteristics. 900 Series valves are hydraulically operated, diaphragm actuated, pilot controlled globe type valves. 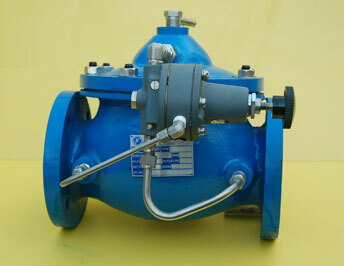 The 1000 series valves consists of booster pump control valve. 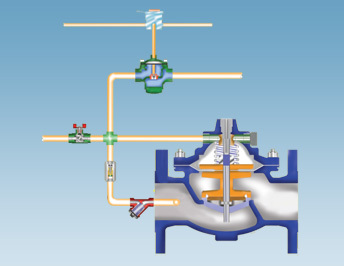 The valve opens at controlled rate of flow which is adjustable and closes same way at desired flow limits. 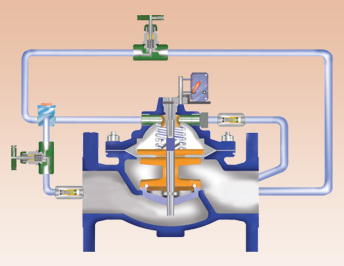 The valve and pump are electrically interlocked to complete the desired action. Voltages : 24, 48, 115, 230, 460,-60 cycle AC 6, 12, 24,115,230-DC. Designing automatic control valve is a critical balancing force on one hand you must confidence not only in the quality and performance of the valve, but also in the knowledge and hands-on expertise of the manufacturer. On the other hand, product reliability must be unquestio-ned, meeting the exact design parameters specified. Orders must be shipped as promised, keeping your job on track, and after the sale support is essential. You can count on Nu-Tech to deliver the highest quality automatic control valves available, and service second to none. Designing automatic control valve is a critical balancing force on one hand you must confidence not only in the quality and performance of the valve, but also in the knowledge and hands-on expertise of the manufacturer. On the other hand, product reliability must be unquestioned, meeting the exact design parameters specified. Orders must be shipped as promised, keeping your job on track, and after the sale support is essential. You can count on Nu-Tech to deliver the highest quality automatic control valves available, and service second to none. Our premises trained engineers offer detailed specification assistance, analyzing system conditions to recommend the right valve for your application. 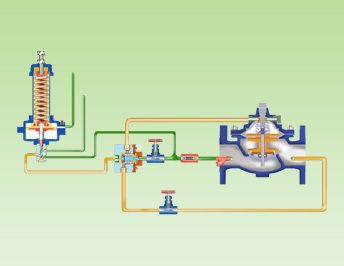 System, material and application considerations are reviewed, so the right control valve is selected for your project. You can be confident that Nu-Tech and our local representatives are ready and able to assist your design team. With a long service in commercial plumbing, municipal waterworks, fire protection, irrigation, aviation fueling, marine, theme park, decorative fountain, light industrial and reclaimed water markets. Nu-Tech has the expertise and products to meet your needs. Nu-Tech has kept pace with changing market , developing and delivering quality automatic control valves at affordable prices. 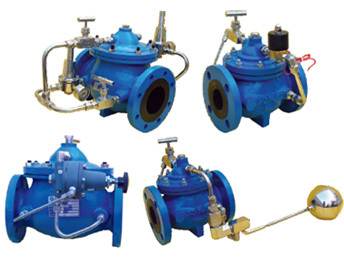 Our fusion bonded, epoxy coated, ductile iron automatic control/valves offer long life and minimal maintenance. And for harsh applications and environments, our fabricated stainless steel valves provide a cost effective solution. Whether your application requires pressure, level, pump or flow control, Nu-Tech is your best choice for selection, sales and service. In no case should the flow velocity exceed 25 ft/sec. if a greater flow is required, use a large valve.